I can't believe how quickly time flies. I had been waiting for summer what seemed like forever, and suddenly it's the middle of July. We have quite mild summer this year, at least for my taste. 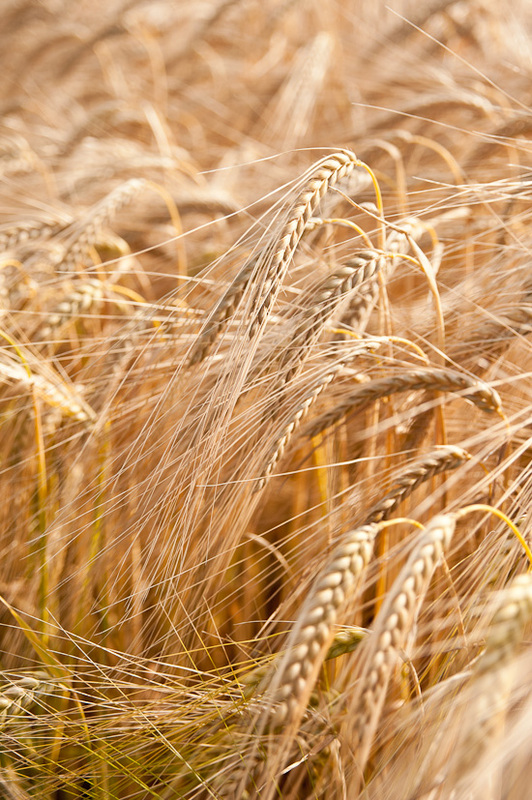 I'm a summer kind of girl and I love hot summer months with temperatures around 30C. But it's just not a case of British summer. Unfortunately, we even don't plan any summer holiday this year which means I have to be happy with British summer. Absence of super hot summer days of course doesn't stop me from enjoying typical summer tastes and treats like ice creams and sweet juicy fruits. My favourite pick your own farm supplies me with summer fruit and vegetable that we don't grow in our small kitchen garden. I really enjoy picking seasonal fruit and veg and turning them into delicious meals. 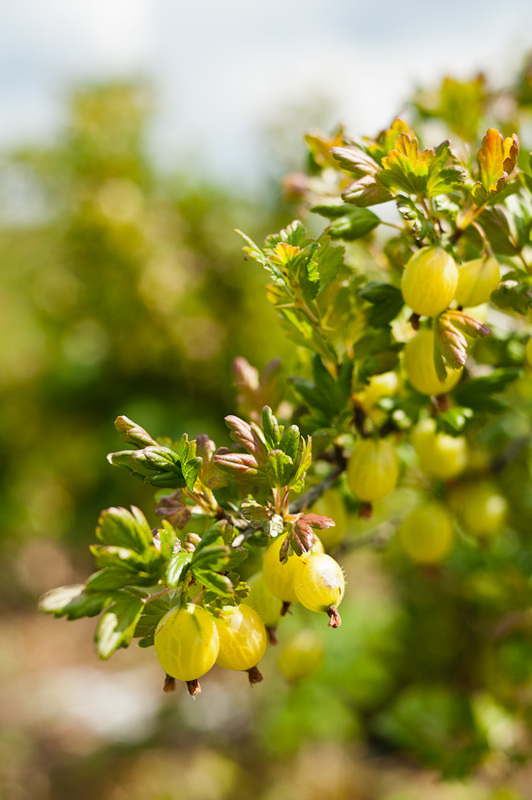 A typical summer fruit which is difficult to find in local supermarkets is gooseberry. It's quite underestimated fruit but it's so delicious and packed with vitamin C. Many people don't like gooseberries for their typical tart taste, but I can eat kilos of them. 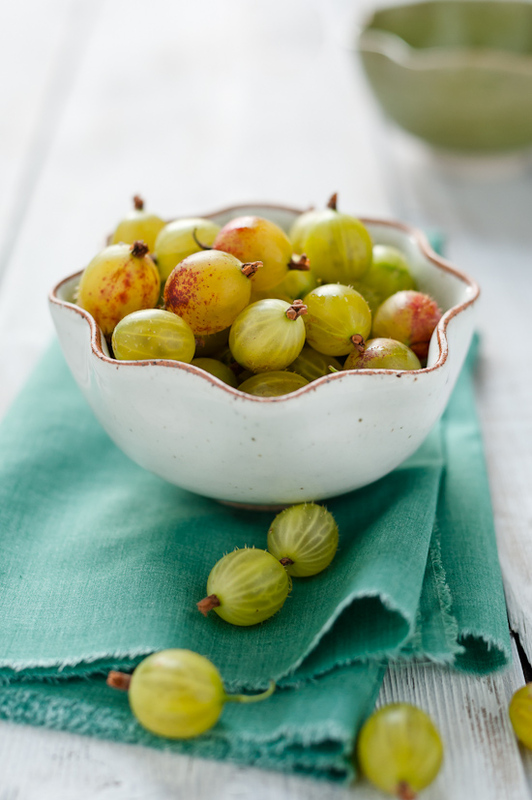 As I've already said in my last blog post, gooseberries were one of my favourite fruit when I was a kid and they bring so many memories from my childhood. I would always pick and eat gooseberries straight off the bush in my grandparent's garden. P. and I always try to spend as much time in nature as possible during weekends. 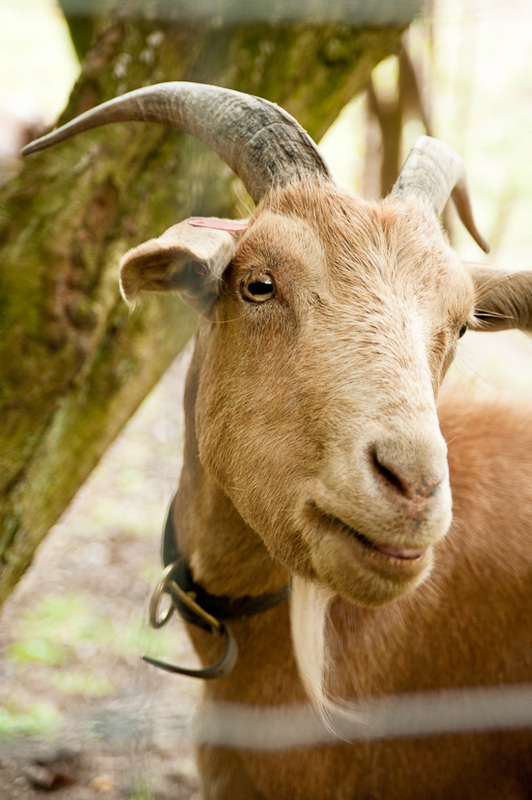 Quite often our weekend trips lead us to the nearest pick your own farm. 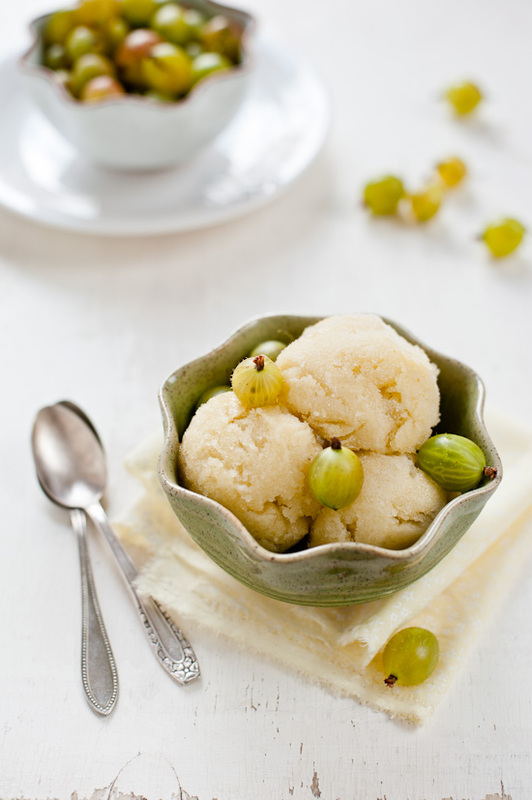 We picked so many gooseberries last time that I decided to make a gooseberry sorbet. 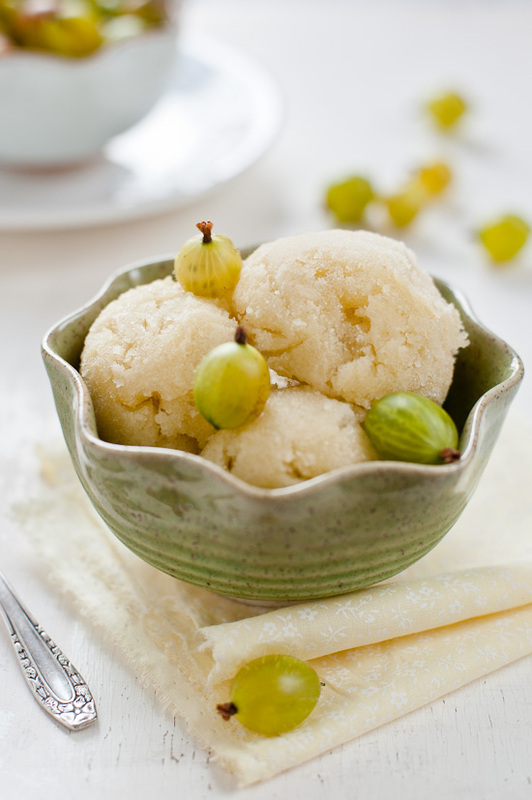 I've never tried to make gooseberry sorbet before and I was really surprised how delicious it was. 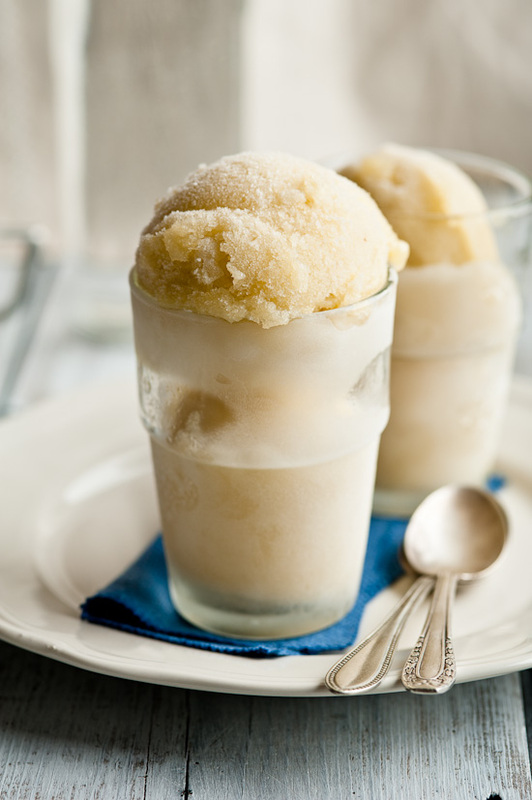 It's very refreshing not overly sweet sorbet and same as all sorbets it's very easy to make. Put sugar and water in a medium sauce pan, heat over medium heat and stir until the sugar is dissolved. Add gooseberries, bring to the boil and simmer for 5 minutes. Let it cool down slightly before pureeing in a blender or food processor. Press the mixture through a sieve into a bowl, squeezing out as much juices as possible. Leave the puree to cool completely, then pour into a freezer safe container and place in a freezer. When the sorbet starts to freeze around the edges, take it out of the freezer and stir with a fork to break up any frozen sections. Return to the freezer and repeat the process until the sorbet is completely frozen. If you are using ice cream maker, churn according to the machine instruction.